​2017 Medal Winner:The Girl Who Drank the Moon, written by Kelly Barnhill and published by Algonquin Young Readers, an imprint of Algonquin Books of Chapel Hill, a division of Workman Publishing. 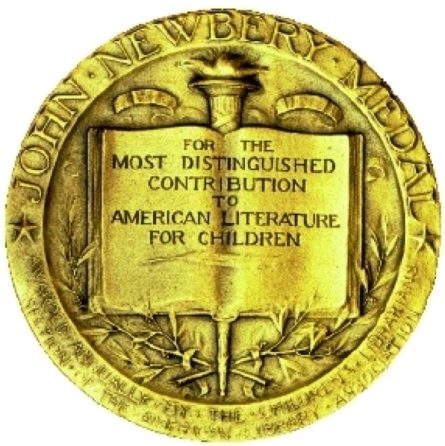 “This compassionate, hopeful novel invites children everywhere to harness their power, and ask important questions about what keeps us apart and what brings us together” said Newbery Medal Committee Chair Thom Barthelmess. Freedom Over Me: Eleven Slaves, Their Lives and Dreams Brought to Life by Ashley Bryan, written and illustrated by Ashley Bryan and published by Atheneum Books for Young Readers, an imprint of Simon & Schuster Children's Publishing Division. Inspired by an 1828 estate appraisement, Ashley Bryan honors the lives of eleven slaves in poetry and collage. Conveying the terror of the patterroller and the hope of voices raised in song, Bryan imagines for each person a life of oppression and a dream for freedom. The Inquisitor’s Tale: Or, The Three Magical Children and Their Holy Dog, written by Adam Gidwitz, illustrated by Hatem Aly and published by Dutton Children's Books, Penguin Young Readers Group, an imprint of Penguin Random House LLC. Informed by six years of research, and reminiscent of “The Canterbury Tales,” Adam Gidwitz has written a brand-new illuminated manuscript, a sometimes harrowing, sometimes hilarious epic about three magical friends on the run in 1242 France and their encounters with a dragon, a holy dog, and cheese. Wolf Hollow, written by Lauren Wolk and published by Dutton Children's Books, Penguin Young Readers Group, an imprint of Penguin Random House LLC. Set in rural Pennsylvania during World War II, this compelling story of consequences addresses complex issues of bullying, PTSD, and discrimination. At the center of this atmospheric novel, articulating themes of self-reliance, hope, and justice, is our heroine Annabelle who struggles to confront her tormentor and her own conscience. View the complete list of Newberry Medal & Honor books.